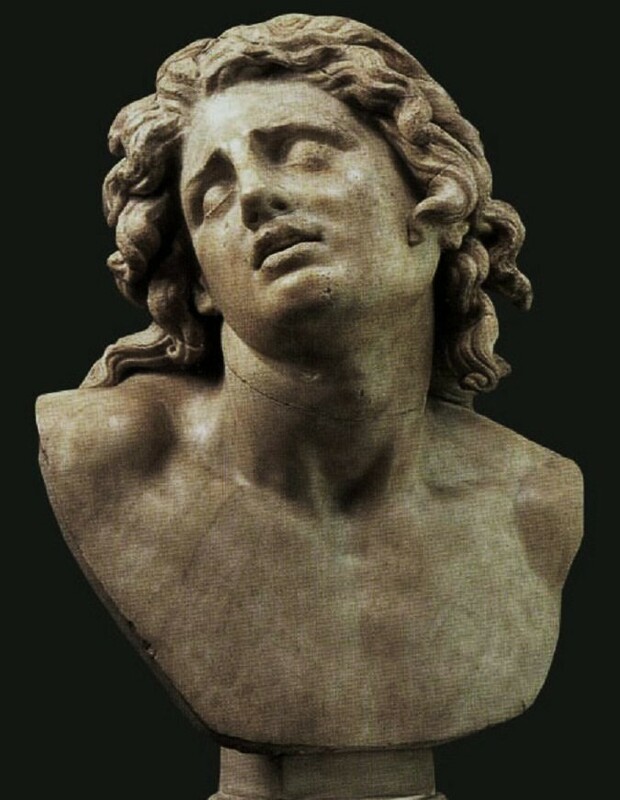 Head of the so called Dying Alexander, Hellenistic art, Uffizi Gallery. Until recently, popular biographers and most scholars viewed Alexander the Great as a genius with a plan, a romantic figure pursuing his vision of a united world. His dream was at times characterized as a benevolent interest in the brotherhood of man, sometimes as a brute interest in the exercise of power. Green, a Cambridge-trained classicist who is also a novelist, portrays Alexander as both a complex personality and a single-minded general, a man capable of such diverse expediencies as patricide or the massacre of civilians. 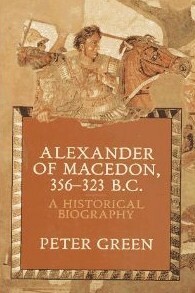 Green describes his Alexander as ‘not only the most brilliant (and ambitious) field commander in history, but also supremely indifferent to all those administrative excellences and idealistic yearnings foisted upon him by later generations, especially those who found the conqueror, tout court, a little hard upon their liberal sensibilities’. This biography begins not with one of the universally known incidents of Alexander’s life, but with an account of his father, Philip of Macedonia, whose many-territoried empire was the first on the continent of Europe to have an effectively centralized government and military. What Philip and Macedonia had to offer, Alexander made his own, but Philip and Macedonia also made Alexander form an important context for understanding Alexander himself. Yet his origins and training do not fully explain the man. After he was named hegemon of the Hellenic League, many philosophers came to congratulate Alexander, but one was conspicuous by his absence: Diogenes the Cynic, an ascetic who lived in a clay tub. Piqued and curious, Alexander himself visited the philosopher, who, when asked if there was anything Alexander could do for him, made the famous reply, ‘Don’t stand between me and the sun’. Alexander’s courtiers jeered, but Alexander silenced them: ‘If I were not Alexander, I would be Diogenes’. This remark was as unexpected in Alexander as it would be in a modern leader. For the general reader, the book, redolent with gritty details and fully aware of Alexander’s darker side, offers a gripping tale of Alexander’s career. Full back notes, fourteen maps, and chronological and genealogical tables serve readers with more specialized interests. Hephaestion 356 BC – 324 BC, general in the army of Alexander The Great, Alexander’s life long friend and lover. Hephaestion, son of Amyntor, was a Macedonian nobleman and a general in the army of Alexander The Great. Hephaestion was the dearest of all the Alexander’s friends; he had been brought up with Alexander and shared his life and his secrets. Friendship lasted their whole lives, and was compared, by others as well as themselves, to that of Achilles and Patroclus. His military career was distinguished. 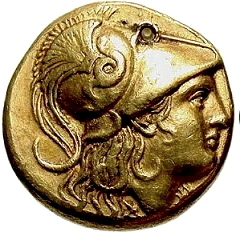 A member of Alexander The Great’s personal bodyguard, he went on to command the Companion cavalry, and was entrusted with many other task through Alexander’s ten year campaign in Asia, including diplomatic missions, the bridging of major rivers, sieges, and the foundation of new settlements. Besides being a soldier, engineer and diplomat, he corresponded with the philosophers Aristotles and Xenocrates, and actively supported Alexander in his attempts to integrate Greeks and Persians. Alexander formally made him his second-in-command when he appointed him Chiliarch of the empire, and made him part of the royal family when he gave him as his bride Drypetis, sister to his own second wife, Stateira, both daughters of Darius III of Persia. When Hephaestion died suddenly at Ecbatana, Alexander was overwhelmed with grief. He petitioned the oracle at Siwa to grant Hephaestion divine status, and Hephaestion was honoured as a Divine Hero. At the time of his own death eight months later, Alexander was still planning lasting monuments to Hephaestion’s memory. Hephaestion’s exact age is not known. No concise biography has ever been written about him, likely stemming from the fact that he died before Alexander and none of those among Alexander’s companions who survived him would have had a need to promote someone other than themselves. Many scholars cite Hephaestion’s age as being similar to Alexander’s so it’s fair to assume that he was born about 356 BC. 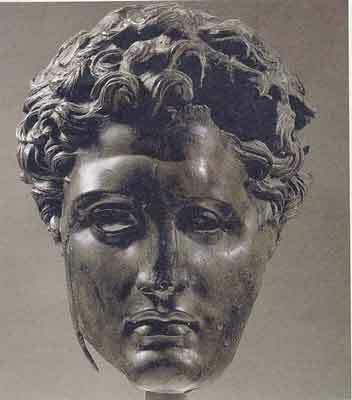 Hephaestion is said to have become a page in 343 BC, a role common to adolescent boys of the aristocratic class in Macedon. Now a member of court life, it is possible that the two future conquerors would have met around this time. The only surviving anecdote from Hephaestion’s youth comes courtesy of the Alexander Romance. According to this tale “..one day when Alexander was 15 years old..sailing with Hephaestion, his friend, he easily reached Pisa and he wentt off to stroll with Hephaestion”. That Alexander’s exact age is given provides another clue to Hephaestion’s upbringing because at fifteen Alexander and his companions were at Mieza studying under Aristotle. Hephaestion has never been named among those who who attended the lectures at Mieza, but his close friendship with Alexander at that age suggests strongly that he was numbered among them. More telling is Hephaestion’s name being found in a catalogue of Aristotle’s correspondences. The letters themselves no longer exist, but for them to have found their way into an oficial catalogue, their content must have been of some significance. It implies that Hephaestion received a good education, and shows that Aristotle was impressed enough by his pupil to send letters throughout Alexander’s expanding empire to converse with him. A few years after the lectures at Mieza, Hephaestion’s presence was notably absent when several of Alexander’s close friends were exiled as a result of the Pixodarus affair. Among those exiled by Philip II after Alexander’s failed attempt to offer himself as groom to the Carian princess were Ptolemy, Nearchus, Harpalus, Erigyius, and Laomedon. The reason for Hephaestion’s absence from this list could be due to the fact that all of the exiled men were older friends of Alexander, Erigyius himself roughly 24 years older than the prince. Hephaestion was a contemporary of Alexander and it is likely that his influence might have been seen as less of a threat than these more mature companions. Whatever Hephaestion’s opinion had been on the whole affair, like many of Alexander’s other childhood companions he was not exiled in its aftermath. While it is true that very little detail of Hephaestion’s childhood and education can be found, that which remains gives credence to what is known about his later life. His friendship with Alexander was long lasting, as was his tenure in the court at Pella; he even shared the same education as the future Great King of Greece and Asia. With such a promising start, age and experience would have helped mould Hephaestion Amyntoros into the man who would one day be the second most powerful man in Alexander’s empire; second only to the king himself.